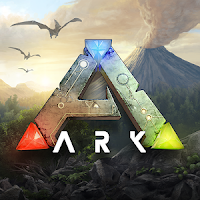 ARK: Survival Evolved - a multiplayer online game in which you have to survive on a tropical island that is inhabited by dinosaurs, and the weather conditions are extremely unstable and hurricanes, typhoons and rains are quite common. You can survive both alone and in the company of real players, while you will have the opportunity to tame prehistoric lizards and direct their strength and skills for the benefit of your alliance. Excellent graphics, almost unlimited opportunities for development and crafting, a huge selection of items, weapons and other loot made this project one of the most popular in the genre of survival simulators. Initially, ARK: Survival Evolved came out on consoles and desktop platforms, but now it's time to try your hand at the handset owners.